Enjoy traveling in scenic Switzerland and admire majestric Alpine views, glacier climbing cable cars and magificient crystal lakes adorned by charming villages and towns on high plateaus. Upon individaul arrival in Zurich transfer to your hotel. rest of the day at leisure for own activities. Overnight in Zurich at the Hotel Swissôtel Zürich****. This morning we will embark on a sightseeing tour of Zurich and its main monuments. Take in fabulous views of the Alps and Lake Zurich from the Höhenstrasse. We will stop briefly in Rapperswil, the quaint City of Roses. For our return trip to Zurich we will take a cruise on Lake Zurich. Arrival at Zürich-Bürkliplatz. Walk on own way back to the hotel or discover the city on your own during your free time. Accommodation at the Hotel Swissôtel Zürich****. Departure for Lucerne, a lovely lakeshore city surrounded by mountains on the shores of Lake Lucerne. Short sightseeing tour and free time to explore on your own. At noon we continue to Engelberg, a ski resort town with fantastic views in summer and winter alike. Take the rotating Rotair cable car to the top of Mount Titlis and its spectacular glacier. From an elevation of 3.020 m, you can enjoy spectacular views of the Central Alps. In the afternoon we continue to the lakeside village of Brienz, again in fantastic setting and visit the local wood carvers the village is famous for. 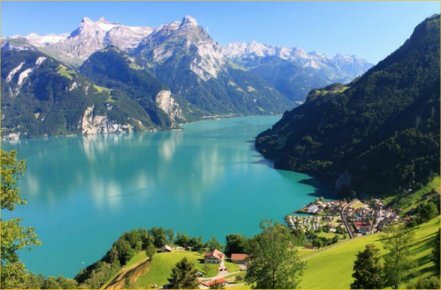 Our next destination is Interlaken nestled near two beautiful lakes at the foot of Mount Jungfrau. Accommodation at the Hotel Hotel Interlaken****. From Interlaken we drive along the majestic glacier lake, Lake Thun to Bern on the shores of the Aare river. After a sightseeing tour of the capital city famous fort its high culture and sophistication, we continue to Gruyeres, capital of Swiss cheese production and a picturesque village with its impressive medieval castle. Overnight in Geneva at the Hotel Ramada Encore***. Morning tour of lovely Geneva and visit the beautiful parks along the lake, the cathedral and the European headquarters of the UN. Then we travel to Lausanne and Montreux, passing the magnificent Chillon Castle. Arrival in Montreux, free time on your own. In the afternoon we travel up the Rodano river valley as far as Täsch, the gateway to Zermatt with its typical Swiss Alpine houses and flower covered balconies. From here you continue by narrow gauge train to Zermatt, a popular alpine ski resort nestled at the foot of mighty Mount Matterhorn. Dinner and accommodation at the Hotel Alex in Zermatt****. In the morning you are free to explore at your leisure or take an optional excursion to the top of Mount Gornegrat of an elevation of over 10 thousand feet 3146 metres. (not included). In the afternoon we return to Täsch where we board the bus for a spectacular drive over the high Nufenen mountain pass to Airolo. Return to Zurich. Arrival back in Zurich at 6:30 p.m. Drop off at the the trqain station or at the Swisshotel. End of tour program. Extra nights in Zurich can be booked or check out our Switzerland to Amsterdam Rhine river cruises. • English -Spanish speaking tour guide, (driver-guide for groups of 7 persons or less). Tour is guaranteed with minimum 2 people. • Accommodation as specified in the itinerary.